Makube was found in a sack as a child. Only his last name, Makube, is known, for it was written on the bag itself. He later came to be known as MakubeX, the 'x' symbolizing an unknown variable, and his "name" is always written in romaji. MakubeX is a genius hacker, capable of manipulating computers to do whatever he pleases. He was originally taught by Gen but swiftly surpassed him in skill. He was raised by Gen, whom he calls Grandfather, but left home to join the VOLTS. During the VOLTS's rule of Infinity Fortress, he was one of the "Four Kings", alongside Shido Fuyuki, Fuuchouin Kazuki, and Masaki Kurusu. 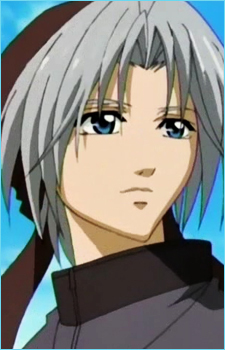 After Ginji Amano left the fortress, he, as the only one of the Four Kings remaining, took over, instituting a dictatorial rule; he was known at this period as the "young demon king". During the 'Infinity Fortress' arc, the GetBackers are hired to retrieve the mysterious 'IL' from him. It is later discovered that IL is in fact a computer disc containing important data required for producing an atomic bomb. (however, IL is also a short form for "implosion lens", one of the most crucial parts of an implosion-type nuclear weapon). The arc ends with his reconciliation with Ginji, who acknowledges the transfer of power. MakubeX's second-in-command is Sakura Kakei. In the IL arc, his four chief subordinates were Juubei Kakei, Haruki Emishi, Takuma Fudo, and Kyoji Kagami; Fudou vanished afterwards, but Juubei and Emishi remained with him. In the manga, after the Divine Design arc, Toshiki Uryuu came under him; he assigned the newcomer to his old comrade, Juubei.